Reference number for this case: 4-Oct-54-Nantes. Thank you for including this reference number in any correspondence with me regarding this case. and I spoke with the occupant"
Here is the surprising story we received from a reader of the conversation she had on the banks of the Loire, between the river and the saucer, with a character of beyond. What I want to tell you is not taken from a science fiction novel. These are real events that occurred in front of me. You will probably think I'm an hallucined, because I too have seen a flying saucer, but I did not dream, strange as it may seem. Last Monday, in the morning, I was riding a bicycle on the banks of the Loire. Suddenly, I heard myself called by a normal looking man, who stood in a grove near the road. Not paying attention to it the man repeated his call. I stopped and asked him what he wanted. He did not answer, but made a gesture for me to approach. Hesitantly I walked and it was then that I noticed the strange garb of man. He wore a sort of brown combination, boots and in the hand he was holding a kind of mask vaguely resembling a gas mask. He made me a sign to follow him to a nearby field. Surprised but curious I followed with some anxiety. I will never forget the moment when I saw a saucer, yes a flying saucer, posed in the field. Literally frozen with fear, I tried to run away, but my legs did not respond, leaving me there, awestruck, like living a dream. My eyes went from the strange craft to the man standing beside me smiling mockingly. I began to doubt my reason, but I had to face the facts, I was not dreaming. Gradually I regained my composure, I detailed the craft placed in front of me. It was a translucent disc, ten meters in diameter and about two feet high. It was topped with a kind of transparent dome. A door was open on the surface, showing the inside of the apparatus. On the inner walls were all kinds of weird devices. In the center was a circular table covered with knobs, buttons and lit green lamps. The craft rested on three retractable legs, like on airplanes. I noticed weird signs painted in black on the hull that were unlike any letter of languages or dialects of our world. At that moment, I had no doubt that I was in the presence of an extraterrestrial being. I turned to him in amazement. There he was, brown, tall and thin, smiling at me. And then he spoke to me in French, with a strange accent. He told me not to be scared, he did not want any harm. Imagine my amazement when he assured me h was coming from another world. "Do not be surprised if I speak your language, our civilization is much more advanced than yours, it has powers that your kind could not imagine to exist. "We are aware of all the conflicts that disrupt your earth and this is why for some time you see unknown craft roam in the sky. Tests on weapons you have trouble us. Our concern is for our peace and the duration of the solar system in which your planet and ours belong. If another world war is declared, we would be there as observers. All attempts to destroy would be annihilated by means unknown to your scientists. We hope we will not have to act in your interest and ours." This strange conversation ended with these words. He headed to the "saucer". I saw him puttin on a helmet looking like that of mine workers. He gesture to me and then entered the craft. The door closed by sliding silently and suddenly a pale yellow light illuminated the saucer. A kind of whistling sound came from openings around the hull. It slowly rose vertically, like a helicopter, up to ten meters above the ground. Crutches disappeared then it moved slowly taking height and then faster and faster to soon reach a vertiginous speed. It soon disappeared from my view. There are no words to describe the state of mind in which I was after this extraordinary occurrence. I told my strange adventure to my husband. At first he thought I was making fun of him, or that I had lost my mind. But as I repeated my claims his skepticism gradually disappeared and it was he who inspired me to write to you. I, who did not believe in these stories of "hallucinated" I now say that there are other beings superior to us and who live in a different world. I repeat that I'm not crazy, I have my reason. I wish to remain anonymous to protect me from some inconveniences. What will the future that appears to us scary bring! Editors' note - Note that this story is not without a rather striking resemblance to the script of the movie "The Day the Earth stoos still" by Robert Wise. Our correspondent may be a person who frequents the movie theaters. Last Monday, in the morning, I was wandering by bicycle on the edges of the Loire. Suddenly, I heard myself called by a man of normal aspect who stood in a thicket, close to the way. As I was not paying attention, the man renewed his call. I stopped and asked him what he wanted. He did not answer, but beckoned to me to approach. With hesitation I advanced and at this point in time I noticed the strange getup of the man. He wore an aviator suit of brown color, boots, and in the hand he held a sort of mask resembling vaguely a gas mask. He beckoned to me to follow him in a nearby field. Astonished but curious, I followed him with a certain apprehension. I will never forget the moment when, emerging in the field, I saw his saucer, yes, a flying saucer. Literally frozen in fright, I wanted to flee, but my legs did not obey and I stayed there, amazed, as if living a dream. My eyes went from the strange machine to the man standing close to me who smiled with a mocking face. I found myself doubting my reason, but I had to surrender to reality, I did not dream. Little by little I begun to recover my coolness, I detailed the apparatus posed in front of me. It was a translucent disc, of ten meters in diameter by two meters height approximately. It was surmounted by a kind of transparent cupola. A door opened on the smooth surface letting the interior of the machine appear. On the inside walls were all sorts of bizarre apparatuses. "Do not be astonished that I speak your language, our civilization, much more advanced than yours, has means which your scientists would not even imagine the existence. We are informed of all the wars which plague your planet and it is for this reason that for some time you see unknown machines furrowing your sky. The tests of the weapons you have worry us. We fear for our peace and for the duration of the solar system of which your earth and ours are part. If another world war were declared, we would be there, as mediators. Any attempt at destruction would be annihilated by means unknown to your scientists. We hope that we will not have to intervene, in your interest as in ours". This strange briefing finished on these words. He moved towards the "saucer". I saw him pu on a helmet carrying an eye, like that of the minors. He made a sign of the hand to me then entered in its apparatus. The door slid without noise and suddenly a pale yellow light illuminated the saucer. A kind of whistling sound escaped from openings located all around the saucer. It rose gently vertically, like a helicopter, up to ten meters above the ground. The crutches disappeared, then it moved slowly, taking height, and this more and more quickly, to reach a vertiginous speed. It soon disappeared from my sight. There is no word to describe the state of heart in which I was after this extraordinary appearance. I told my strange adventure to my husband. He believed initially that I was making fun of him, or that I had lost my reason. But in face of my repeated assertions, his skepticism disappeared little by little and it is him who urged me to write to you. Me, who did not believe in these stories of "hallucinated", I claim now that there are other beings higher than us and who live in another world. I repeat to you that I am not insane, that I have all my reason. I make a point of keeping anonymity to preserve me certain nuisances. What does such an alarming looking future reserve to us?" Editors note: This account is not without presenting a quite striking analogy with the scenario of movie "the Day the Earth stood still", by Robert Wise. Our correspondent is perhaps a person who attends movie theaters. The website indicates that on 4 October 1954 at 10:00 in Nantes, France, "Domed disc with clear dome in field, occupant, described as looking like an 'aviator in a flight-suit' seen on bridge." The website comments that it was a "Close encounter with a an unidentified craft and its occupants. One domed disc was observed on a bridge for nine minutes. One being, wearing a flight suit, was seen." The witness was on his bicycle exploring the river edge when suddenly he heard a man calling him, who stood by a thicket close to him. At first he ignored the man but he called for him again. He stopped and asked him want he wanted. He did not answer, but beckoned for him to approach. With hesitation he advanced towards the man and at this point noticed what he was wearing. He wore a brown aviator suit, boots and in his hand held something resembling a gas mask. He beckoned the witness to follow him to a nearby field. Astonished but curious, he followed him with a certain apprehension. As he arrived at the field he saw what appeared to be a disc-shaped craft on the ground. Frozen with fright he wanted to flee, but his legs did not obey him and he stayed there, stunned as if in a dream. The man standing next to smiled at him with a mocking face. He described the object as a translucent disc, about ten meters in diameter by two meters in height approximately. It was surmounted by a kind of transparent cupola. A door opened on the smooth surface making the interior of the machine visible. On the inside walls there well all sorts of bizarre apparatuses. In the center there was a circular table covered with levels buttons and lit with green lights. The machine rested on three retractable legs. At this point he noticed on the hull odd sings painted in black, which did not correspond to any letter or languages or dialects on earth. Amazed he looked at the man who was still there smiling at him. At this point he spoke to the witness in French, with a strange accent. He told him not to be frightened, that he wasn’t going to harm him. He then told the witness that he was from another world. He then added, ‘Do not be astonished that I speak your language, our civilization, is much more advanced than yours. We know all about the wars that plague your planet (and the ones to come) and is for this reason that for some time our aircraft have been flying over your world”. He then continued, “Your nuclear weapons tests worry us. We fear for the peace of the solar system of which your Earth if part of. If another World War would start we would intervene. Any attempt of destruction would be stopped and annihilated by means unknown by your science. We hope that we will never have to intervene.” The strange briefing finished with these words. The extraterrestrial then walked toward his saucer at the same time putting on the helmet that he was carrying. He saluted the witness with his hand and then entered the object. The door slid close without a sound and suddenly a pale yellow light illuminated the saucer. A sort of whistling escaped from openings located all around the saucer. It then rose gently vertically like a helicopter ten meters from the ground. The landing gear disappeared, it then moved slowly gaining altitude and reaching a vertiginous speed it disappeared from sight. The author indicates that there was a close encounter of the third kind in Nantes, Loire-Atlantique, on October 4, 1954 in the morning at an unknown exact hour. "Last Monday morning I was riding a bicycle on the banks of the Loire, and suddenly I heard a man of a normal appearance standing in a grove near the road. I stopped and asked him what he wanted, and he did not answer, but motioned me to approach. He was wearing a brown aviator suit, boots, and in his hand he was wearing a kind of mask that resembled a gas mask and he motioned me to follow him to neighboring field, surprised but curious, I followed with a certain apprehension, and I never forget the moment when I saw his saucer, a flying saucer, literally frozen in fright, but my legs missed me, dazed, as if in a dream, and my eyes went from the strange machine to the man standing by me, smiling mockingly. I began to doubt my reason, but I had to surrender to reality, I did not dream. Little by little, I regained my composure, and described the apparatus placed before me. It was a translucent disc, about ten meters in diameter and about two meters high. It was surmounted by a kind of transparent dome. A door opened on the smooth surface, revealing the inside of the machine. On the inner walls were all sorts of weird apparatuses. In the center was a circular table covered with green handles, buttons and lamps. The craft rests on three retractable crutches, as on planes. It was then that I noticed on the hull some odd signs painted in black, which did not correspond to any letter of tongues or dialects of our world. At that moment I no longer doubted that I was in the presence of an extraterrestrial being. I turned to him, stunned. He was there, brown, tall and thin, still smiling as he looked at me. And then he spoke to me in French, with a strange accent. He told me not to be frighted, that he wished me no harm. Judge of my stupor when he assured me to arrive from another world. Awestruck, I literally drank his words. He continued, 'Do not be surprised if I speak your language, our civilization, much more evolved than yours, has means of which your scientists would not even imagine existence. We are aware of all the conflicts that are disrupting your Earth, and for this reason you have for some time seen unknown devices criss-cross your sky. We are concerned about the weapons testing you have. We fear for our tranquility and for the duration of the solar system of which your land and ours are part. If another world war were to break out, we would be there as mediators. Any attempt at destruction would be annihilated by means unknown to your scholars. We hope that we will not have to intervene, in your interest as in ours. This strange conversation ended with these words. He walked over to the saucer. I saw him wearing a helmet bearing an eye, like that of miners. He waved at me and then went into his room. The door slid quietly and suddenly a pale yellow light illuminated the saucer. A kind of whistle escaped from openings all around the saucer. It rose gently vertically, like a helicopter, up to about ten meters from the ground. The crutches disappeared, then it moved slowly as it climbed faster and faster to reach a dizzying speed. It soon disappeared before my eyes. There are no words to describe the state of mind in which I found myself after this extraordinary apparition. I told my strange adventure to my husband. He thought at first that I was joking, or that I had lost my reason. But before my repeated assertions, his skepticism gradually disappeared and it was he who urged me to write to you. I who did not believe in these stories of hallucinated, I now assert that there are other beings superior to us and who inhabit another world. I repeat that I am not mad, that I possess all my reason. I want to keep anonymity to protect myself from some inconvenience. What does the future hold for us in such a frightening way?" 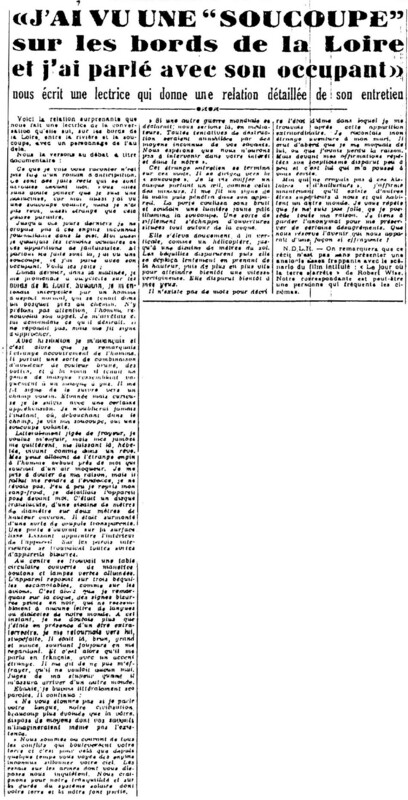 The sources are indicated as La Résistance de l'Ouest for October 9-10, 1954; Jean-Sider, "Le dossier 1954 et l'imposture rationaliste", pages 182-184. He says that the remarks about the movies by the editor is interesting but say that he editors forget to specify that the movie was inspired by the contactees stories of the beginning of the fifties. This remark by Jean Sider is quite irrelevant, since it does not even matter that much if the letter was inspired by a movie inspired by contactees stories of by contactees stories directly. Directly or indirectly, one contactee story does not give credence to another later one, the influence problem remains whole in any case. And the editors are right in that the chances are high that the writer was inspired by an extremely well known movie which may have just been shown there at the time. Jean Sider notes what he finds atypical in the story: that the being talks with his voice and in French and with an accent to the witness. This is not really atypical. While some such reports or story have extraterrestrials talking in unintelligible words or making unintelligible sounds or not communicating at all, there were already many stories of extraterrestrial encounters in which the extraterrestrial talks the language of the witness, sometimes with an unusual pronunciation. This is also how it works in the movies: the extraterretrials talk the spectator's language, otherwise the specator cannot understand; an unusual accent is often used to symbolize their otherwordly origin. Jean Sider says that normally, the communication with extraterrestrial is telepathic, not vocal. Again this is irrelevant here: in 1954 and before, in stories made up by people claiming communication with aliens, "telepathy" was seldom involved. Telepathy claims were quite advanced claims at that time, when people did not necessarily find it strange that extraterrestrial beings simply talk with us. In any event, all attributions we make on how extraterrestrials should behave must rest on solid cases, not on discredited contactees stories and anonymous letters. Jean Sider says that he has trouble believing this story. He adds that since the witness does not show signs of unbalance and because there is no proof that it is an invented story, he finds that it would be regrettable to put the story in the crank stories file and he thus prefers to deliver it "with caution." While I agree that there is no absolute evidence that the letter is an invention, it certainly has many of the features found in many other such letters in which no evidence appears, such as the similarities with a popular science fiction movie released at that time. Anyone could have written such a letter, there is no real possibility to "prove" it is an invented story whatsoever, and there is not one reason to believe it is a true story. To me this letter classifies as invention in the lack of evidence that it is not. Not doing so would result in including irrelevant data in the extraterrestrial encounters file. This US movie was out in 1951, directed by Robert Wise on Harry Bates' short story "Farewell to the Master". The basic plot is that a human looking alien lands in his classical flying saucer and tells the people of Earth that we must stop all wars and give up weaponry and live peacefully, otherwise the aliens will have to destroy us because we are a danger to other planets. 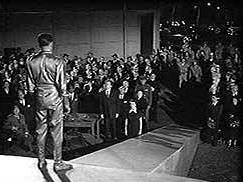 Above: Klatu, the extraterrestrial being in the movie "the day the earth stood still". Appearance: a man in an aviator's suit. Above: The French version movie poster. I will not tell how I detect it, but this text was written by a man and not a woman. [ro1] Article in the regional newspaper La Résistance de l'Ouest, Nantes, France, page 2, October 9-10, 1954. [js1] "Le Dossier 1954 et l'Imposture Rationaliste", book by Jean Sider, Ramuel publisher, France, pp 182-184, 1997. [gz1] "RR3 - Le Dossier des Rencontres du Troisième Type en France", book by Julien Gonzalez, Le Temps Présent publishers, France, pp 106-108, 2014. 1.0 Patrick Gross March 16, 2009 Conversion from HTML to XHTML Strict. First formal version. Addition [ud1]. 1.1 Patrick Gross October 8, 2014 Addition [ta1]. 1.2 Patrick Gross October 19, 2014 Addition [ro1]. 1.3 Patrick Gross February 17, 2017 Addition [gz1].